Deschutes Brewery, a major craft brewer, has tapped Roanoke for its eastern U.S. brewery and tasting room, which are slated to open in three years. The Bend, Ore.-based company expects to invest $85 million in the project and create 108 jobs. Deschutes made hundreds of site visits during the past two years before picking Roanoke. Other states in the running for the project included North Carolina and South Carolina. Deschutes is the eighth-largest craft brewer in the U.S. by sales volume, according to the latest available data from the Brewers Association. Deschutes President Michael LaLonde said the company was impressed by its reception in Roanoke, where it was greeted with a grass-roots social-media campaign. “We have absolutely been blown away with how the community rallied around bringing us here and has given us such a warm welcome,” he said in a statement at the time of the announcement. 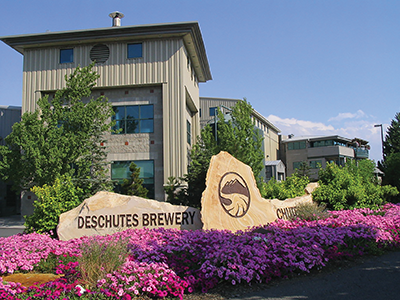 Deschutes, founded in 1988, is a family- and employee-owned brewery. Its beers include Fresh Squeezed IPA, Black Butte Porter and Mirror Pond Pale Ale. Last year, Deschutes shipped 343,689 barrels of beer from its Bend facility to 28 states. Its beer is currently available in Northern Virginia. Distribution should reach Roanoke in August and the rest of the state by the end of the year. State incentives for the Deschutes project included a $3 million grant from the Commonwealth’s Opportunity Fund. The company also will be eligible to receive a grant of up to $250,000 from the Governor’s Agriculture and Forestry Industries Development Fund, depending on its use of Virginia- grown products. In addition, Deschutes is eligible for $7.9 million in incentives from Roanoke, many of which are performance-based. The city will provide land valued at $2.75 million for the brewery site at the Roanoke Centre for Industry and Technology (RCIT) and make $3.4 million in infrastructure improvements. Beth Doughty, head of the Roanoke Regional Partnership, says the brewery project is expected to have a more than $200 million annual impact on the regional economy, indirectly creating 305 jobs.